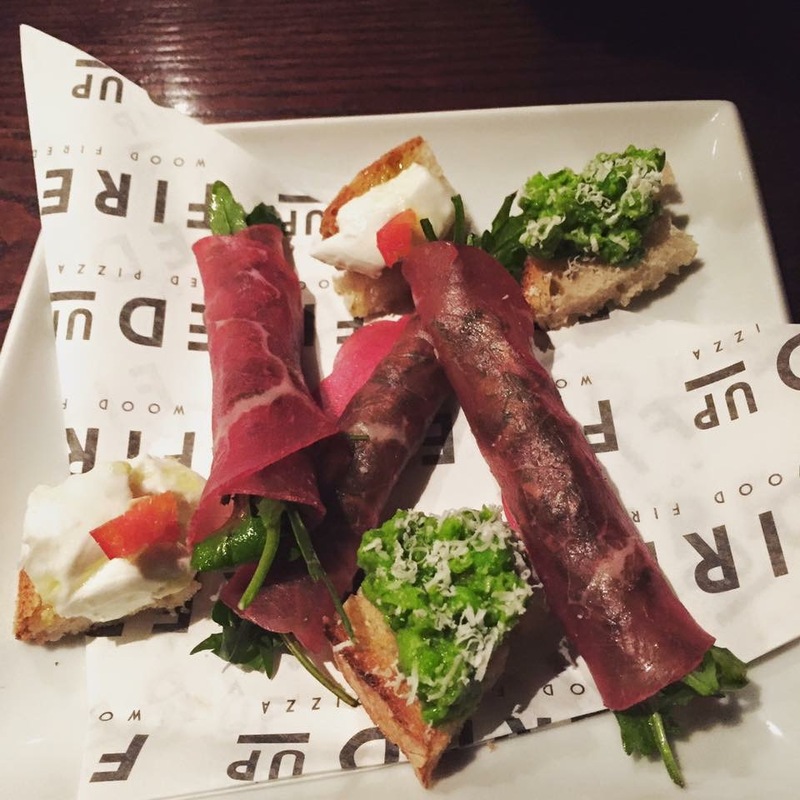 The nibbles for the launch, whilst not on the menu, were made with Fired Up’s selection of fresh ingredients such as artisan cured meats from their antipasti board as well as cheese and roquito peppers for their pizza toppings. 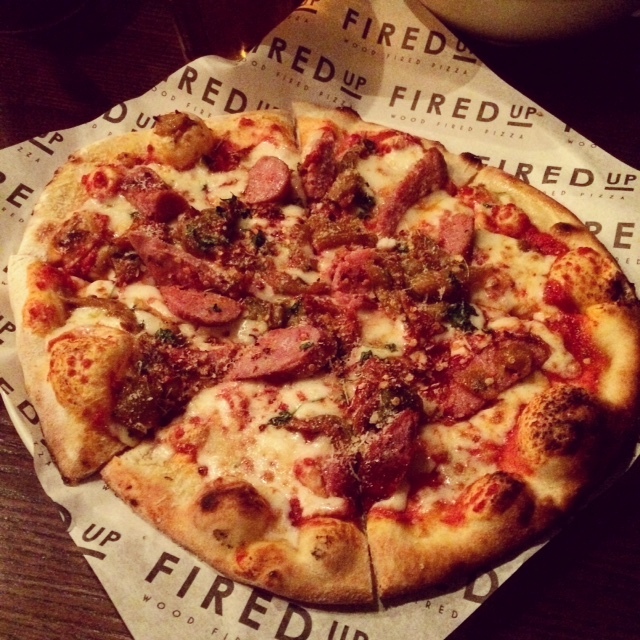 Fired Up’s mobile pizzeria is usually found at festivals, fairs, private events and foodPark. I raved about their pizzas in my foodPark NIGHT MARKET posts here, here and here. Desserts: chocolate pot, sundae or sorbet. The menu also features mini pizzas and ice cream scoops that are sure to please the little ones. We decided to try their starters and sides, which were big enough for 2 people to share. 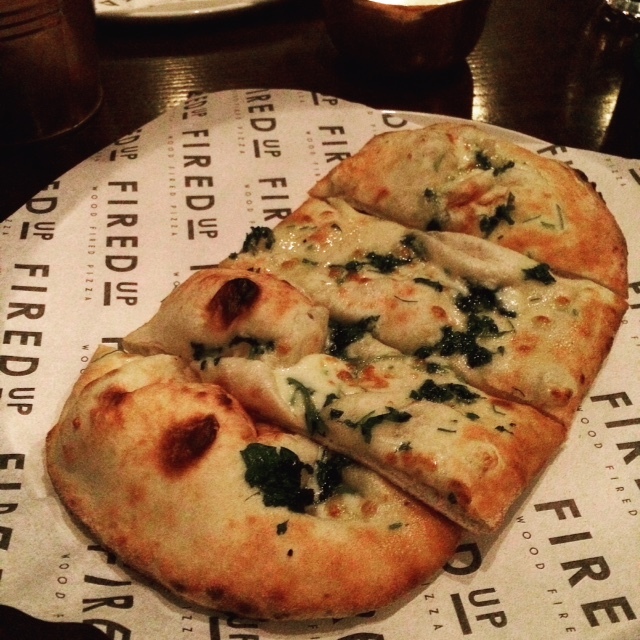 We had wood fired garlic bread with mozzarella and rocket, made with Fired Up’s excellent dough. We also enjoyed a fresh salad featuring rocket and shaved parmesan in balsamic and olive oil dressing. Simple, yet delicious as all of the ingredients were high quality. 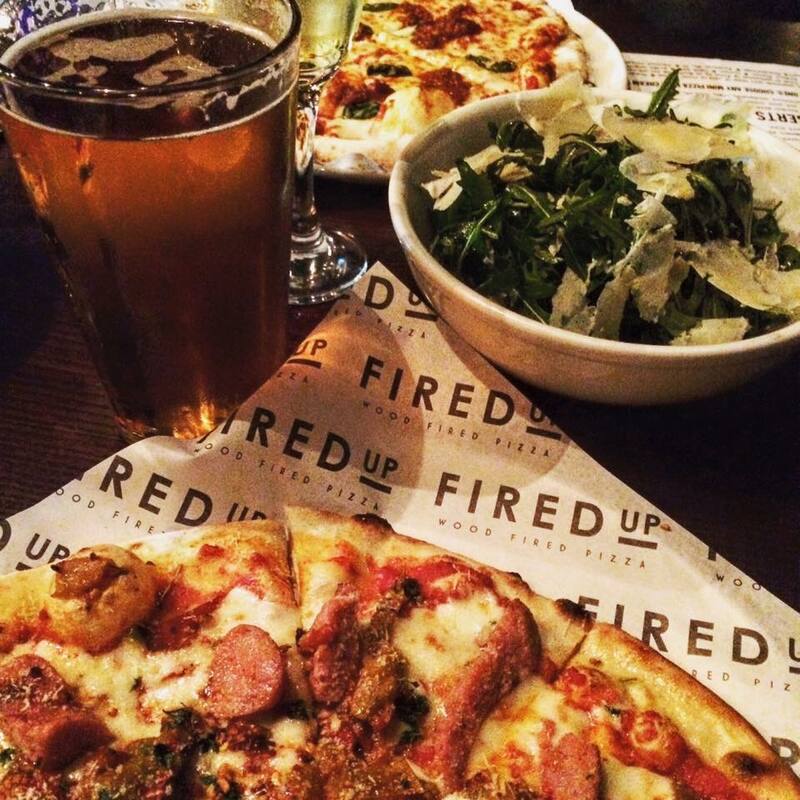 Fired Up’s homemade dough really sets them apart from your average pizza. Nancy and Rory’s research in Naples several months ago has really paid off, resulting in a light, yet crisp and tender pizza dough baked to perfection in their portable brick oven. With imported Italian tomatoes and virgin olive oil as base ingredients, Fired Up’s pizza is a real winner! I still need to try Fired Up’s other pizzas but couldn’t resist my favourite… the ‘nduja and basil pizza! ‘Nduja is a spicy spreadable sausage from Calabria, Italy which adds a lot of smoky, piquant flavour. Pronounce it any way you like but ‘nduja will always mean spicy deliciousness! The other pizza ordered was topped with spicy sausage, roasted peppers, chilli, fresh herbs and parmesan. I’ve had this one before and it’s a real winner, especially for those who want a little kick to their pizza. Tuesday to Thursday: dinner 5pm to 10pm. Friday and Saturday: lunch noon to 2:30pm, dinner 5pm to 10pm. Sunday: noon to 8pm, films at 3pm and 6pm. 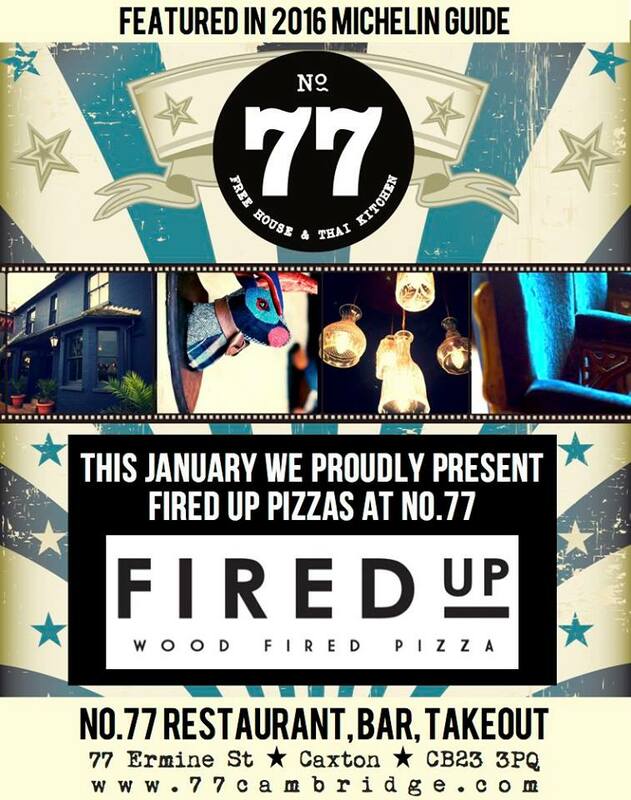 In the meantime, No.77 will be celebrating Fired Up’s pop up with live music, pizza making sessions and Italian themed films. Follow them for more details. I know I’ll be making the most of Fired Up’s presence at No.77. They really do whip up some of the best pizza around. My Italian ancestors would be proud! I was invited to attend the launch of Fired Up’s pop up at No.77. The fizz and nibbles were complimentary but dinner was at my own cost. All views are my own. Fired Up and No.77 were unaware that my experience would be the basis of a written review. I did not receive compensation for my review. This entry was posted in Restaurants and tagged Cambridge, Cambridgeshire, Caxton, Fired Up, Fired Up Pizza, N'Duja, No. 77, pizza, pop up by One Two Culinary Stew. Bookmark the permalink.